When making the card in the previous post, I couldn’t decide between circle punches or square punches. 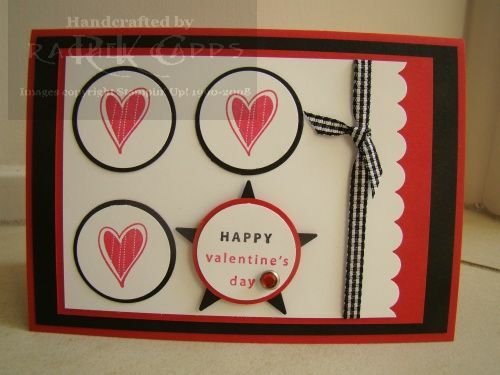 As you know, I chose circle punches for the previous card. So, then I decided to use up the square punches left over. This is what I came up with. Again, I used the stamp sets, Hello Again and Occasions for All. And again, I used textured cardstock for the Basic Black and Real Red. I did add a dash of Pink Passion under the scallop squares. It just peeks through, which I love! 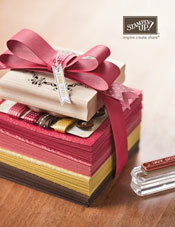 And I love the Clips Assortment, added at the top with a touch of black gingham ribbon and Real Red grosgrain ribbon. Time to buy more Clips Assortment for me, I’ve used them all up. I thought this would make a great card for my hubby, but now he’s seen it, so I might have to make him a different one! Last week, Jo had her team’s usual holiday get together at her house. All we had to do was bring along a “card in a box” and a part of the yummy lunch we enjoyed. So this was my “card in a box”. We made 6 cards each on the day (not including our own) and had 7 kids running around and playing, so nicely together, around us. It was a lovely day! For this card I used the stamp set Hello Again, available in the Summer Mini, and also the Hostess Level 2 stamp set, Occasions for All. The colours are, naturally, white, black and red! And although you can’t see it in the picture, the white and black card stock is textured. 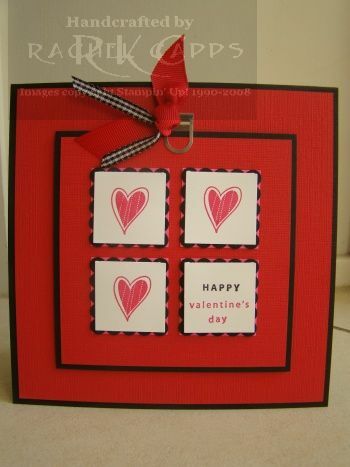 I love the way Polka Dot Punches embosses … the heart just looks elegant. The silver was a perfect colour for a masculine card … and I teamed it up with the Going Grey Textured cardstock (not having enough Silver) and the Basic Grey Taffeta ribbon. And ever since I earned the First Level Hostess stamp set, Party Punch, I have wanted to use the “Be Mine” stamp with the Round Tab punch … and I remembered to use it! I’m really amazed I remembered! It’s so easy to forget you have a particular stamp, isn’t it? !